The brown-headed nuthatch (Sitta pusilla) is a small songbird found in pine forests throughout the Southeastern United States. The Bahama nuthatch was and still is considered a subspecies (S. p. insularis) by several authorities including the IOC, but the IUCN and BirdLife International have reclassified it as its own separate species. The bird, like other nuthatches, possesses a sharp black nail-like beak, which it uses to pound open seeds. It is a frequent visitor to feeding stations and is highly fond of sunflower seeds and suet cakes. Despite the other species' common name, the brown-headed nuthatch is about the same size as the pygmy nuthatch and the two species are the world's smallest nuthatches. 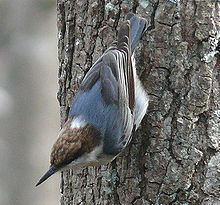 In the brown-headed nuthatch, the total length is 9–11 cm (3.5–4.3 in), wingspan is 16–18 cm (6.3–7.1 in) and body mass is 10–12 g (0.35–0.42 oz). This species sports a brown cap with narrow black eyeline and buff white cheeks, chin, and belly. Its wings are bluish-gray in color. A small white spot is found at the nape of the neck. The bird's call is a sharp whee-hyah sounding very similar to a "rubber duck" toy and particularly is loud for a bird its size. They also make softer "pit pit pit" calls while in flight as well as other squeaking noises. If heard or seen well, this species is virtually unmistakable in the wild, since it overlaps only with the very differently marked and larger red-breasted and white-breasted nuthatches. ^ BirdLife International (2012). "Sitta pusilla". IUCN Red List of Threatened Species. Version 2013.2. International Union for Conservation of Nature. Retrieved 26 November 2013. ^ Hayes, William K.; Robert X. Barry; Zeko McKenzie; Patricia Barry (2004). "Grand Bahama's Brown-headed Nuthatch: A Distinct and Endangered Species" (PDF). Bahamas Journal of Science. 12 (1): 21–28. Wikimedia Commons has media related to Brown-headed Nuthatch. "Brown-headed Nuthatch media". Internet Bird Collection. This page was last edited on 10 July 2018, at 05:06 (UTC).